A documentary crew has gathered footage from the past seven years and is finishing up their film called, The Emerald Archer: The Hood and The Rise Of Vigilantism. Some of the footage includes interviews with Quentin Lance, Sarah Lance, Ricardo Diaz, Thea Queen, Barry Allen, Cindy Simone, and Rory "Ragman" Regan. The documentary crew is in Star City to get footage and finish the documentary now that Ms. Pedowitz finally has the funding she needs. William comes home while Oliver is filming and he's clearly upset. He asks about the cameras and Oliver asks them to stop filming as he doesn't want William to be in the film. Dinah and Oliver are at a parking garage where an incident has been called in. They find Rene who was protected by the vest. He tells them the guy they were after took the New Green Arrow. Oliver and Dinah force the cameras to stop rolling. Oliver and Dinah reprimand Rene before asking who attacked him and Emiko. The person was wearing a mask, looked military. Dinah runs into the mayor who tells her she's going to do a town hall on vigilantism and force Oliver to defend his actions from all the years. An angry William yells at Felicity and tells her to take off any encrypted virus or software she's put on his tablet. She asks him if he wants to talk and he asks why they wouldn't let him come home for Christmas break. She tries to explain that things were crazy in Star City but he tells her it wasn't fair what they did to him. Oliver asks Diggle if he can use ARGUS's security footage and Diggle's help to find the New Green Arrow. He tells Diggle that Emiko is his sister. Diggle and Oliver come to the realization that they have been very distant this past year. Before they can fix that Curtis comes in to help with the security footage. Oliver and Diggle arrive at the Starling City Atheltic Center to look for their military man and any signs of Emiko. Diggle finds a shrine filled with masks from other vigilantes including Rene's, Roy's, Helena's and Emiko's. Curtis claims to have found the target who he has christened Kymara. He was heading to 101 Federal Street, which used to be Adam Hunt's building. Oliver and Dinah warn the camera crew that being with them on this mission is dangerous but they want to stay. Kymara surprises them with bullets and explosives. Oliver, Diggle, and Dinah manage to fight him off but he escapes. However, they do find Emiko who warns Oliver that Kymara is coming for him. William comes over to Rene's to visit Zoe. Rene becomes overprotective when he worries William might like Zoe as more than a friend. Zoe tries to get William to open up but he's unable to. Diggle tells Dinah about the masks at the hospital and how he hasn't been able to get in contact with Roy or Helena. Dinah and Oliver agree that Oliver attending the mayor's town hall isn't the best idea. Emiko sneaks out of the hospital and is greeted by Rene in their layer. She tells him that she is Oliver's half-sister and says she didn't want to risk changing things by telling him. Rene assures her it won't change their partnership. While away from the cameras, Oliver tells Dinah that the New Green Arrow is his half-sister. Dinah gives him the news that Mayor Pollard refused to let Oliver sit out of the town hall. Diggle comes up with a solution, reunite Team Arrow to assure the safety of those citizens in attendance. Oliver protests the idea at first but Diggle eventually convinces him that it's the right thing to do. Team Arrow prepares for Kymara while Oliver defends his actions at the town hall. Kymara interrupts the town hall and Team Arrow including Dinah eventually takes him down. However, Mayor Pollard has Rene, Diggle and Curtis arrested for their vigilantism. SCPD reveals to Oliver that Kymara's real name is Kevin Meltzer. The Green Arrow saved his life seven years ago and he's been obsessed with vigilantes ever since. Laurel tells Diggle, Rene, and Curtis that as the DA she can refuse to press charges but there aren't a lot of good options here. All three men assure Oliver that this isn't his fault and it was their decision, and it felt good to reunite Team Arrow one last time. Felicity comes home and tells William she came across a fake version of his school's website and didn't see any grades or test results. He tells her that he got expelled. Dinah and Oliver both tell Pollard that they are handing in their resignation as long as their friends are charged. 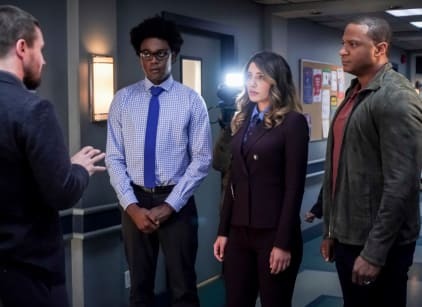 Pollard tells them that the Anti-Vigilante Law is still in effect but Diggle, Rene, and Curtis will all be deputized just like Oliver. Oliver brings the documentary crew to Team Arrow's old lair that's now destroyed thanks to Diaz. He tells them that Team Arrow will return, rebuild and be better this time. In the future, Maya aka Blackstar is watching the documentary. Her friend Connor asks where she got it as it was banned years ago, but takes back the question because the less he knows the better. She assures him he's going to want to come with. Maya arrives at Team Arrow's old lair, which is deserted and dusty. She tells Connor that vigilantes were the death of Star City and they got exactly what they deserved. Vigilantes were the death of Star City and they got exactly what they deserved. Permalink: Vigilantes were the death of Star City and they got exactly what they deserved.